If you're looking for a place on the beach you have found it. 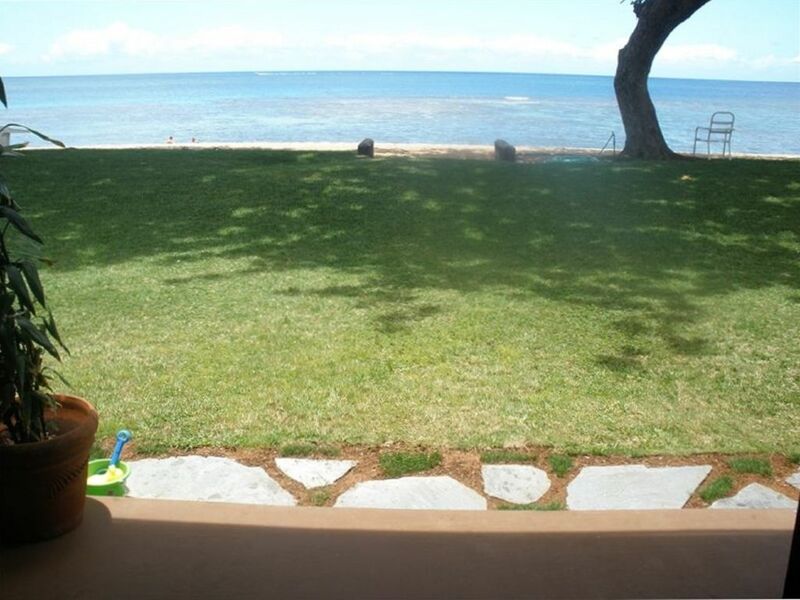 You can enjoy the beach view from the kitchen, living room, and lanai. Stunning Views! No buildings to walk around, No stairs to climb, and no hassle! Count your steps to a beautiful sandy beach and blue ocean! There are two buildings on this property and this unit is located on the bottom floor, in the Beachfront building away from the sounds of traffic so that all you hear are the sounds of the ocean. Newly remodeled unit with A/C in the bedroom w/ attached bath. Up to 2 guests can enjoy this spacious, 1 bedroom, 1 bathroom fully furnished living and kitchen area with WiFi . You never have to leave this beachfront condo to feel as though you have been to the beach! This is the perfect getaway for a relaxing and peaceful vacation away from the big city to the remarkable North Shore of Oahu. The unit has been completely remodeled and you will find bamboo floors throughout the condo. The kitchen has a beautiful granite counter top, new fridge, and stove, microwave, and is basically fully furnished for all your cooking needs. You can enjoy the newly remodeled bathroom with a marble shower. Bed and Bath linens are provided along with Beach towels, and beach chairs. Set your worries aside and enjoy a breathtaking view of the panoramic tropical ocean and majestic sunsets, which can be seen from your couch, on your lanai, or at tables near the BBQ grill on the manicured lawn. Also enjoy watching turtles on the beach and snorkeling, or surfing in the clear ocean outside your door. You can sit and enjoy the serene ocean or take a brief walk along the beach park, and boat harbor to find surf spots, souvenir shops, fine restaurants, and more in the Historic Town of Haleiwa. We are located just minutes away from some of the worlds greatest beaches and surf spots(Pipeline, Sunset, Waimea Bay). In the winter months (October-March), you can check out the big wave surf competition next door (Triple Crown Surf). If you are looking for the truly Hawaiian experience away from the business of life, then you have found the ideal getaway! My husband's job brought us to Hawaii 10 years ago and fell in love with Haleiwa Surf. We are on-site and easily available if needed. Haleiwa is a wonderful place to to not only vacation but raise a family as well. Our oldest daughter is handicap and when buying the property we wanted a place that she would feel safe and would be close by the water to swim. It is a quite peaceful place to just relax, great snorkeling and swimming. We are a 15 minute walk into town. Unit in the bedroom to be ran night hours only. Onsite coin operated for exclusive use by Haliewa Surf residents and guest. Free Wifi internet with locked password. Bath towels and beach towels are provided. spices,cooking oil and limited amount of other cooking items. You can enjoy eating with a table and two chairs on the lanai. There is also 3 bar stool in the kitchen. 37 inch flat smart tv. Netflix is available for a charge per movie. Bicycles for rent off site a short 15 minute walk into town. There are two buildings located on the property. We are in the front building and around thirteen steps from the beach. No steps to climb. Janet's property was perfect for the first part of our Hawaii honeymoon! Would highly recommend. Great condo on the beach! Really great condo on the beach. Everything was clean and the condo is well appointed. It’s about a 15 minute walk to Haleiwa town where there are cute shops and restaurants/food trucks. Would stay again for sure! One of the nicest, cleanest, most comfortable vacation rentals we have ever experienced. The bright and tasteful furnishings were appreciated. Janet you are a great hostess and we appreciate your attention to detail and your willingness to take the extra steps you took to make our stay extra special for us. I would highly reccommend your awesome place to anyone who appreciates the finer things in life. It is so nice to be able to just take a few steps off the lanai and you are right on the beach. The windows in the bedroom make it also bright and airy which is wonderful. Thank you for your hospitality and hope to see you again next year. The condo was nice, clean, and comfortable — really liked the kitchen renovation. The view was lovely as was the beach. We enjoyed being so close to the iconic activities on the north shore. Janet, the owner, was friendly and accommodating. Very clean and well located, direct on a nice swimming beach. All basic item are in the condo, we enjoy it. Beautiful condo, the beach couldn't be any closer, magnificent view! Haleiwa is a great town to stay in, nice shops and restaurants. We look forward to coming back and staying here again! Watching Tours/ Deep Sea Fishing (Haleiwa Boat Harbor).